The Escape Artist Mouse is attracted to Gauntlet Cheese Tier 2. No Charms are required to attract the Escape Artist Mouse. Hunters can encounter the Escape Artist Mouse only in the King's Gauntlet location when hunting in Tier 2. The Escape Artist Mouse drops Gauntlet Potion Tier 3 as loot. The Festive Gauntlet Crusher is a Limited Edition weapon that gives double Gauntlet Potion Tier 3 drops from Tier 2 mice. The original thumbnail image for the Escape Artist Mouse featured its left eye, allowing it to be easily confused with the Monster Mouse's thumbnail image. It has since been changed to show the Escape Artist Mouse's tail with the key. 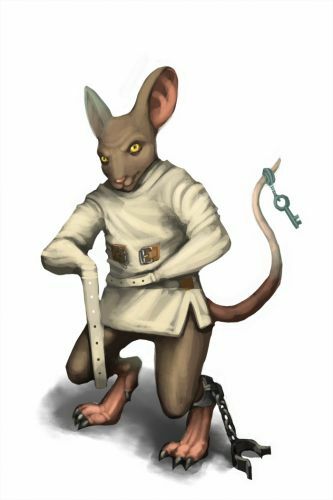 8 June 2010: The Escape Artist Mouse was released with the introduction of the King's Gauntlet as part of the MouseHunt v3.0 update. 15 June 2010: The King granted permission to use the Gauntlet Potion Tier 2, allowing Hunters to access the Escape Artist Mouse. 14 April 2011: The Escape Artist Mouse began dropping the Green Plaid Egg as loot as part of the Spring Egg Hunt 2011 event. This page was last edited on 16 February 2018, at 04:17.